The Samsung Captivate Glide for AT&T Wireless is long overdue. 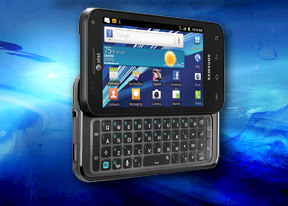 The market is brimming of dual-core Android devices and the slide-out QWERTY packing Samsung Captivate Glide has only just arrived. Interestingly enough, it’s been a relatively quiet year for the fans of the hardware QWERTY droids. The offerings are few, while the potential users are plenty – good news for Samsung’s entry. In terms of specs, the Samsung Captivate Glide is rather closely related to the Galaxy R – the two major differences between the two phones can be found in the screen department and, of course, the presence of hardware QWERTY in the case of the Captivate Glide. The smartphone sports an NVIDIA Tegra 2 CPU with two 1GHz cores and a gig of RAM. The display has been taken straight from last year’s Galaxy S – not a bad a thing since the 4” Super AMOLED unit with WVGA resolution is still is one of the finest screens on the market. Traditionally, we’ll begin by taking a look at the key features of the Samsung Captivate Glide, followed immediately by its main disadvantages. As you can see, there is plenty the Samsung Captivate Glide has to offer. Its hardware QWERTY is one of the most comfortable examples we’ve encountered. The Tegra 2 CPU on the other hand, while not a typical fixture for Samsung’s Android lineup, is certainly respectable in terms of performance. Our initial disappointment came from the fact that the device lacks even the slightest reference to the Galaxy S II family, despite the fact that the Captivate Glide is properly equipped to be a part of it. On this instance, we believe that both Samsung and AT&T have overlooked the marketing potential which such a branding would have offered (Samsung Galaxy S II in all its different incarnations is still selling quite briskly). We are going to continue next with an unboxing of the Samsung Captivate Glide, followed by design and build quality inspection. Editorial: You might notice that this review is shorter than usual and doesn't include all of our proprietary tests. The reason is it has been prepared and written far away from our office and test lab. The Samsung Captivate Glide for AT&T is a US-only phone, so it will probably never get to the shores of the Old Continent. Still, we think we've captured the essence of the phone in the same precise, informative and detailed way that's become our trademark. Enjoy the good read! what i need to do to switch to 2g network manully? plz help and also how is the abttery life?